Add bold shape to your window and bring nature to you with the Small Coveside Window Arch Bird Feeder. The arched design forms a focal point on this feeder, adding a distinctive look to your home. Two clear panels are inset in the arch, creating a reservoir that holds 1.5 quarts of seed. A port on each side of the arch allows birds to reach the feed, and additional small panels may be raised or lowered to monitor the amount of seed that flows from the arch. A wide base offers several birds a place to rest while feeding, and the wooden frame creates a sturdy and classic feeder. The item attaches to your window with three silicone suction cups, and a disc at top of the arch lifts for easy refilling. The lovely mahogany and plastic construction withstand the elements, for a remarkable addition to your home or yard. 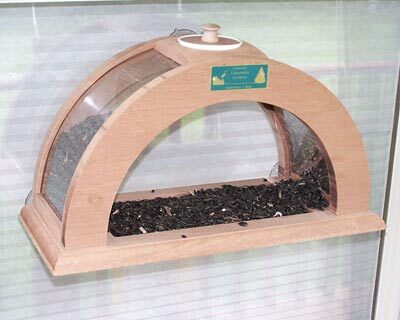 Combine bird feeding and bird watching using this Small Window Arch Bird Feeder. Made in the USA.